We are very proud of our collection. We have a assortment of several unique and one of a kind items seldom seen. We have a wide variety of: weapons, equipment and uniforms that are on exhibit will help our visitors understand the time period better and explain many of the hardships the soldiers of both sides faced, with the technology that was used in the period of history. 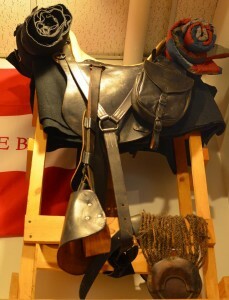 One of the items which can be seen a model 1859 McClellan Saddle, which was used by a cavalry troops in the 9th NY Cavalry. When visit ETT and seen this saddle, you will see it in its original appearance, light color tree (natural cow hide), with black fenders and accessories, in its late war appearance. Our ETT Learning Center has a wide variety of military books for purchase. The greater majority of our military books are of the Civil War era (being that we are a Civil War museum), but we do have publications covering other military time periods as well available. We have a number of books from the American Revolution thru current times. Some of the military periods available are: U.S Presidents, the American Revolution and the Second World War. At ETT, our slogan is “Buy a book, help us Save a Battlefield”. A portion of our book sales go towards Civil War preservation. Our military books for purchase range from new titles to popular stories. From battles & leaders to army campaigns to uniforms & equipment. We have book titles that have been around for decades to newly published. We often have monthly sales on our books, and generally sell our books under or below current market price. Interested in a book, title or military period? Looking for a Civil War book, but don’t want to pay full price for it…..Come check our book titles at ETT. Our Exhibits & displays are unique. Enjoy Western New York’s largest privately owned collection of Civil War era artifacts. We have a large collection of Weapons, Uniforms & Equipment. Many of our displays are under glass, while several of our other exhibits are actually able to be touched. These items in our collect assist us in our “hands on “ programs, where our staff can actually use our items on display and show how items were actually used. Historical research is just one of many opportunity’s and resources we have available at ETT. Not only do we have a large Reference book library, but we have personal to help you in your historical research or to assist you in doing Historical research on your historical projects or in your family tree, etc..
We work closely with the Concord Historical Society & Genealogy Society located at the Lucy Bensley Center at 23 North Buffalo Street in Springville. Start your research at the Lucy Bensley Center, for some Genealogy research work, or some local leads on your research. They have a wide variety of books, references, and topics for your research. Echoes Through Time just added a number of referenced books to add to there new Civil War reference section. Are you looking for information on a Civil War officer? or needing information on a particular civil war action? maybe you are working on a school project or need to do a paper and you are looking for special information to complete your work…. Don’t worry the chances are we have what you are looking for. we have a 1500 + book reference library. Our Civil War Reference Book library is one of the largest privately owned collections in New York State regarding the Civil War era. Our media room has work space, computer internet access for research, DVD player to view movies and includes our Reference Library & Classroom. Our classroom is where we do many of our educational programs. This room is large enough to hold 30+ people. We ample seating & lighting, perfect for any historical / educational talk, or good enough for your groups meeting or program (ask us for details). This Classroom area is great for your groups meeting or talk. Come use it today ! Our bookshop host a number of new titles to old out of print items mostly from the Civil War era. Our selection of both hard cover & soft, from magazines to books. We have a good selection of books. Variety of subjects to choose from. Our gift shop features a number of Civil War related items; Children items to Adults; from collectables to everyday useable items. We carry a limited items for Reenacting. We often have reproduction – uniforms & equipment available – New & Used. Enhance your uniform & equipment or maybe you are looking for that special item as a gift for a Civil War enthusiast. You cant find what you’re looking for. Mention it to us, and we can try to help you find it if we can. Looking for a civil war sewn or printed flag? we have them….Looking for a kepi or equipment? We can get it…. Looking for a custom uniform to be made, Ask us… We can help you there too…. We have a big selection of historical video’s and music doe your entertainment pleasure. Most of our movie selection covers the Civil War era. From the classics with John Wayne to Stephen Lange. Documentaries to History Channel specials. We support our local Civil War musicians and sell their CD’s. There period Civil War music is outstanding and a joy to hear. We have the municipal parking lot directly behind our learning center, plenty of parking for your vehicle. Our parking lot is large enough for a school bus or a motor coach tour bus to come visit, with the access to the adjoining roads off of Main Street or South Buffalo Street. We have a rear entrance just a short walk from the municipal parking lot. Our main exhibit floor is Handicap accessible. Our rear entrance has a ramp to make it easier for wheelchairs, as well as walking through our main front door entrance. Our Learning Center has a lot of advantages to be used as a meeting place for your next meeting or to have coffee with a out of town relative or client, or socialize after church on our back patio….Have your groups meeting down stairs in our classroom…. or talk around our tables inside our center…. We hold our monthly lectures & talks at the around the corned at the Lucy Bensley Center (the Concord Historical Society & Genealogy Society) at 23 North Buffalo Street. Come join us, or share something with us to enlighten others…..
We have a number or resources available for our teachers & educators. – Our Traveling Trunk – can be signed out filled with a number or original & reproduction items, as well as several books, DVD, Etc…. to help you kick start your class as they learn about the Civil war era…..